« Is the mobile Web ready for business app developers? First, a huge thank you to the volunteer organizers and sponsors of DevNexus! The Atlanta JUG‘s annual not-for-profit conference attracted 500 mostly Java developers this year and remains one of the best values of any developer conference in the world. I gave an update on Google App Engine for Java (see slides) and a pitch for HTML5 + Dart (see slides). jQuery Mobile, which lets you build simple, nicely-styled mobile Web sites with mostly HTML and CSS. The DevNexus mobile site is built with it. View source to see how easy it is. Thanks again to Gunnar, Vince, Sudhir, and the gang for making DevNexus such a high-quality event. This entry was posted on March 23, 2012 at 9:32 am	and is filed under Android, AppEngine, Dart. You can follow any responses to this entry through the RSS 2.0 feed. You can leave a response, or trackback from your own site. Thank you so much for presenting!! It was great having you. Just one correction – our attendees number were actually a bit higher. 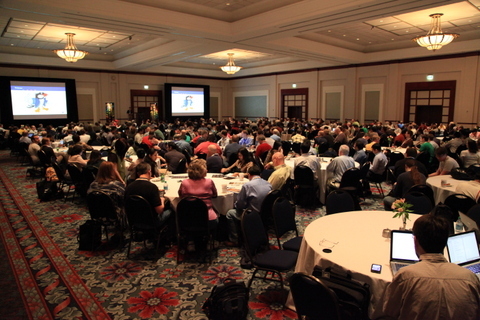 With speakers we had around 650 attendees. I have one question about gwt… Will it be possible: GWT could compile to Dart vm code ? It is technically possible to compile from a strongly typed language to an optionally typed one; however, there is not yet any equivalent in Dart to the GWT Widgets library and the widget code itself would be quite different due to the superior DOM library in Dart. A cross-compiler is definitely on radar as a possible approach, but there’s none today. I looked at the slides of your HTML5 + Dart presentation, and the slide titled “What’s in it for GWT developers?” made me really curious. Am I mistaken, or does it imply that we could one day code GWT apps in Dart ? That’s something I’d love to play with ! I really like Java but I’m impressed by the concise and expressive Dart syntax. I guess that depends on what you mean by “code GWT apps in Dart.” The two are completely separate platforms today. As Dart continues to grow, I expect there will be Dart equivalents to many GWT features. Already there is a nice “dev mode” experience by way of Dartium, albeit no debugger yet. And Dart seems to be taking a lower-level approach on the DOM (no Widgets yet). Bottom line: the slide was just meant to say that some GWT developers may find Dart to be an improved way of coding Web apps.